Fall Events for the West Valley and the East Valley: Scottsdale, Mesa, Chandler, Tempe, Queen Creek, Gilbert, and more! If you are looking to enjoy the beautiful weather in October and November, we have lots of fun events listed here on our Best Phoenix Fall Festivals guide. From Farm Harvest Festivals to fun musical events and everything in between with face painting, inflatables, pumpkins patches and contests! Phoenix Fall Festivals and Harvest Festivals in Southern and Northern Arizona are mostly free admission with fee for extra ride activities (carnivals, etc) or food offered during the festival. Some do offer a FREE pumpkin and FREE food!! We can also check out our Kids Trunk or Treat Phoenix Events guide for a list of mostly free safer Trick or Treating fun for kids who like candy! 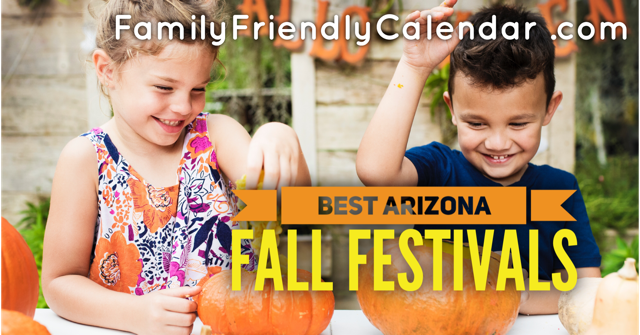 For the full list of family friendly Phoenix Fall Festivals and Harvest Fests see the guide at the bottom of this post. There are always fun family events through out Metro Phoenix so be sure tocheck out our other guides! Like our FREE KIDS EVENTS or our FREE KIDS Movies Guide as there always update with fun things to do in Metro Phoenix with the kids. Receive a free update of fun kids and family friendly events through out Phoenix. Once you subscribe, you can select the types of events you are interested in and we will email you just those. So subscribe! Events include all of Phoenix and Arizona are listed in order by CITY and DATE. There’s always Trick O’ Treating at your local neighborhoods. Some Phoenicians prefer to skip trick o’ treating in lieu of attending a farm festival or a church festival that will have activities for kids, candy, rides and music. Not all festivals are the same. Farms will usually have a pumpkin patch. Lots of harvest festivals offer you the opportunity of a free photo set up for a perfect fall family photos. Thanks to SRP for sponsoring this freebie for all of us. Is your event in our Phoenix Fall Festivals Guide? If you would like help in promoting, contact us! If we missed some, please let us know. If you would like to be included in our Phoenix Events Guide or know of fun event for kids, please contact us. We can’t guarantee inclusion or time of publication but do our best to include Family Friendly Events in Phoenix.